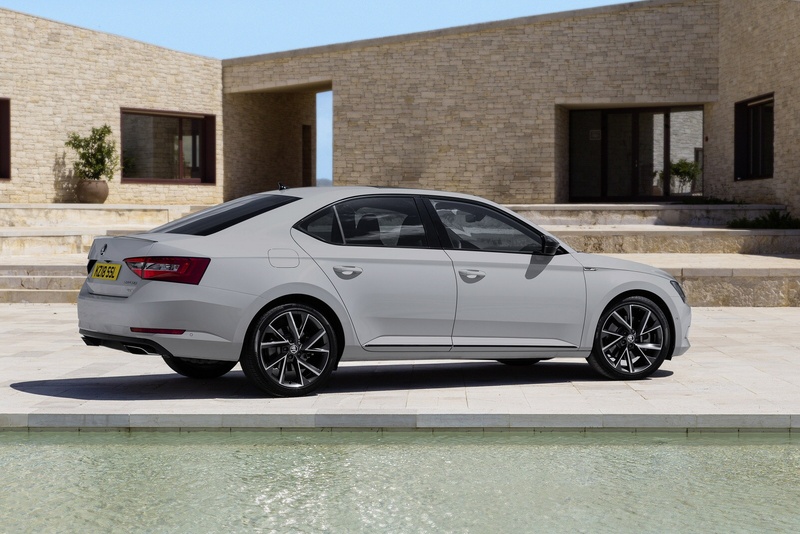 Skoda's Superb features a smart suit, a slick chassis and strong engines in MK3 model guise. This time round, the weird twin-opening hatch is replaced by a more conventional rear aperture but there's still more space inside than in some London starter homes and the pricing remains sensible. If there's one thing that's defined the Skoda Superb, it's that every time it's been launched, the Czech company seems to think it'll enjoy greater success if it's pushed further upmarket. Given that the vast majority of Skoda's profits comes from small cars, that seems quite a leap of faith, but look at the way the market works and you'll start to see the logic. The Superb's rivals, amongst which you can count cars like the Ford Mondeo, the Vauxhall Insignia and the Mazda6, have done likewise. With each successive iteration they get bigger and more polished. To not follow would leave the Superb battling over some very meagre scraps. If you like the sound of a Skoda with real presence, you're probably going to love the MK3 model Superb. The exterior is a whole lot more assertive, with a clean, design-led approach. It's a sign of a more confident Skoda and that's always been a good sign when it comes to their products. Skoda's been dipping into the almost unlimited largesse of the Volkswagen Group to bring us some mouthwatering engine and gearbox combinations with this current Superb. There was a time when Skoda was just given the cast-offs, the engines that were in the final years of production, while Audi and VW got the shiny new technology. That's not the case any longer, with the Superb getting petrol engines like the excellent downsized 150PS 1.5 TSI unit and even a monster 2.0-litre TSI turbo with 272PS, four-wheel drive and a dual-clutch DSG gearbox. Go diesel and you're looking at a base 120PS 1.6 TDI powerplant or the usual 2.0 TDI with either 150 or 190PS outputs. Both of the 2.0 TDI engines are also available with all-wheel drive options. Adaptive dampers are an option and the adaptive drive mode can also adjust the weighting of the electrically-assisted steering. And most models come fitted as standard with DSG auto transmission. On the move, as ever in a Superb, the ride and refinement are exemplary. What's changed with this third generation design though, is this car's dynamic demeanour. Thanks to the adoption of the Volkswagen Group's lighter, stiffer MQB chassis, the car feels far more agile through bends you'll be able to attack with a little more gusto thanks to sharper steering and a standard XDS+ Electronic Differential Lock that reduces understeer and improves stability as you turn. This third generation Superb is a larger car than its predecessor, but that's not the perspective you get from first glance. Somehow here, this Skoda looks more compact and agile than its predecessor and the previous model's boxy, forgettable shape has developed into a stylish silhouette that Chief Designer Jozef Kaban and his team evolved from their dynamic 'VisionC' concept car. Clean-cut lines, smoothly shaped surfaces and sharp edges have been integrated to create one of the most striking and elegant designs in the sector. It's quite a turnaround. After the bold exterior, the interior feels a bit safe in its aesthetics, but there can be few complaints about either quality or space. At 4,861mm long and 1,864mm wide, the third generation Superb is 28mm longer and 47mm wider than its predecessor, while the 2,841mm wheelbase is 80mm longer, allowing for greater space within the passenger compartment. Rear legroom is frankly ridiculous. It's vast in the back. 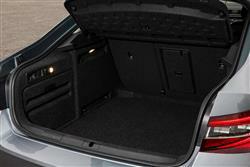 The boot is 30-litres larger than before, at 625-litres, expanding to a cavernous 1,760-litres with the rear seat backs folded. If this still isn't big enough, you'll need to talk to your dealer about the estate version. Here, there's a 660-litre boot, expandable to an impressive 1,950-litres when the seats are folded. Expect to pay from around £24,000 if you want your Superb in Hatch form - or around £25,000 if you want to order the car as an estate. Diesel power requires a premium of around £1,500 over the petrol alernative. As for trim, well even the base Superb S models get a decent run at the equipment list. Here you'll find alloy wheels, air conditioning, LED rear lights, DAB digital radio and a touchscreen infotainment system. A 'Multi-Collision brake' set-up triggers automatic brake intervention upon detection of a collision. The SE models start from around £23,500 and add 17-inch Helios alloy wheels, dual-zone air conditioning, front and rear parking sensors and cornering front fog lights. The SE's impressive specification also includes Adaptive Cruise Control (ACC) and SmartLink - a system that allows smartphone owners to show their phone's display on the car's infotainment screen. Sportline and Sportline Plus variants add a stiffer chassis, alcanatara sorts seats and an XDS differential lock for sharper handling. And if you step further up to the SE L Executive models, you'll find that they feature even more premium equipment, including Bi-Xenon headlights with AFS and LED daytime running lights, leather upholstery with heated seats and Columbus satellite navigation with 8-inch touchscreen. Then there are 18-inch Zenith alloy wheels, an electrically operated boot and Drive mode selection. The top Laurin & Klement model gets the options list fully emptied into it, with 18-inch Pegasus anthracite alloy wheels, tri-zone climate control, a 10-speaker CANTON sound system and piano black decorative inserts. That's on top of Blind spot detection, Lane assist, Park assist, the KESSY keyless entry and start system, a TV tuner and one of those boot opening systems where you wave your foot under a sensor to open the tailgate. This latter feature seems like a good idea in theory but we've yet to come across one that works when caked with road grime. Skoda has forged its modern-day reputation on building quality cars that aren't expensive to run. Here's another one. The new-generation MQB platform it's based upon makes this car up to 75kg - about the weight of an average adult - lighter than it was before and that, along with the Volkswagen Group's latest Euro6 engine technology, has led to improvements of up to 20% when it comes to efficiency. As a result, this Superb shouldn't really cost much more than its smaller Octavia stablemate to run. As before, there's an 'Energy Recovery' set-up to reclaim energy that would otherwise be lost under braking or during cruising. And the usual Start/stop system to cut the engine when you don't need it, stuck at the lights or waiting in traffic. Plus the driver can do his or her bit by keeping an eye on the gearshift indicator on the dash. All these things of course aid the efficiency returns you'll get - which are very similar with the line-up's 1.6 and 2.0-litre TDI diesel engines. The 1.6 TDI Hatch manages up to 52.3mpg on the combined cycle and up to 110g/km of CO2; for the 2.0 TDI 150PS model, the figures are up to 54.3mpg and up to 113g/km of CO2. For the 1.5 TSI petrol Hatch, the figures atre up to 45.6mpg and 122g/km. If you�re looking for a new SKODA Superb 1.5 TSI Sport Line Plus 5dr DSG Petrol Hatchback for sale, you�ve come to the right place. At Bristol Street Motors we don�t just have the best SKODA Superb 1.5 TSI Sport Line Plus 5dr DSG Petrol Hatchback deals, we also offer friendly advice and help with all your enquiries to ensure your buying experience is a happy experience.